This is the whole Vampire gang deciding where to move next. ( includes Bella)! Bella's nervous when Alice drags her along on a karaoke night. She ends up haveing fun however. See which songs I think fit each of them perfectly! Karaoke with Alice and Rosalie. Bella, who's now a vampire, Alice, and Rosalie go Karaoking while their loved ones are out hunting and they get a surprise of their life. Songs from my favorite country singers. Karaoke with Carlisle, Emmet, and Rosalie. Bella, who's a vampire for 4 years, Carlisle, Rosalie, and Emmet go karaoking while the rest of the family is off hunting. Lyrics to my favorite country songs. Takes place before Bella jumps. Bella and her friends go do some Karioke and a certain someone shows up. Two songs: What Hurts the most by Rascal Flatts and I Need You by Tim McGraw and Faith Hill. Karaoke with Jasper and Emmet. Emmet and Jasper take Bella karaoking. Oh fun. Its couple of weeks before Edward and Bella are to be married. Songs of my favorite artists. The boys kinda get gross. Karaoke with Rosalie and Esme. 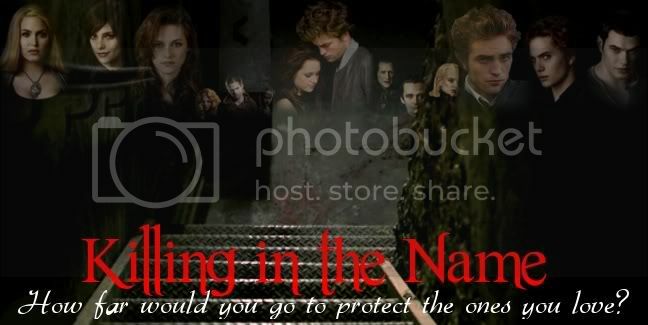 While the Cullens are away on a hunting trip, the Volturi decide to "check in" on Bella. Takes place after Eclipse. Bella, a baby abandoned at a hospital only hours after birth, is taken home to a family of vampires. A story of Bella’s struggle as a human living with 6 vampires, Falling for another who still drinks from humans and finding her birth parents. A drawing of Bella and Jacob kissing in Eclipse, right before the battle starts. Pinpointed to the moment where Bella surrenders to him. Edward still needs some reassurance that Bella forgives him for leaving her. A light Edward/Bella moment after New Moon. 1918. Edward Mason is seventeen and has enlisted in the army to fight in the Great War. When he meets Bella, the girl who dresses like a man in order to Rebel for her beliefs, he quickly falls in love. But, she will have nothing of it-- until its too late. One of two stories to be updated every other day. Songfic. Bella enters a talent show, and sings a song dedicated to Mike, Lauren, and Jessica! Life was far from great in the lives of the Cullens, but when one of there own "cheats on there diet" they are exposed... suddenly the whole world knows about Vampires! ANd needless to say the volturi Are far from happy... So the battle between worlds begins, but no matter the outcome, one of them will die. Who will it be? Vampires or humans? Only time will tell.... SEQUEL TO "WHEN THE WORLD CAME CRUSHING DOWN"!!! !